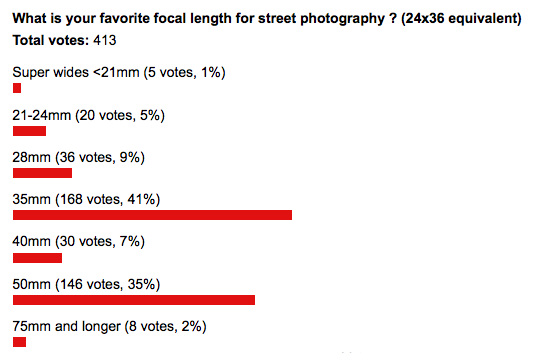 Weekly poll #4 : What is your favorite focal length for street photography? I made some changes to the poll format to allow Ipad/mobile users to participate. Note that the poll lists 24x36mm full frame equivalents, so if you are on a smaller/larger sensor, please make the conversion. Also, and to make it more interesting, feel free to share your lens details in the comments section below. Though I usually shoot with 35mm and 50mm focals, I’d probably go with a 50mm lens if I had to choose one only. As for last week’s poll “What is your main focus method ?” (191 voters). The results showed a 50/50 split between manual and autofocus shooters. Manual focus users tend to prefer to focus using the viewfinder/LCD over zone focus, while autofocus shooters clearly privilege the one point method over multi points. I love the perspective of 21mm – gives the image a surreal twist and also a lot to look at. The Pentax DA15mm limited in combination with a K5 is a great compact and robust combination, for me at least. For me it depends on the situation. For close crowds I prefer the 12mm on MFT (24mm equivalent) which allows me to get real close to people as they walk by me and take the picture. If I have more room I use my 25mm (50mm equivalent). I have shot a bit at 20mm (40mm equivalent) but the lens I have is too slow but I do want to explore the 35mm (equivalent) focal length more.